and historic communities that hold proudly to their frontier roots." 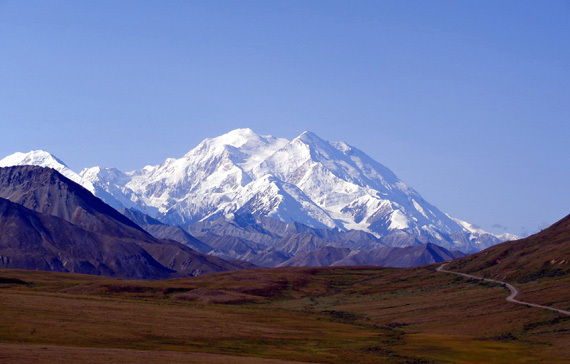 We're finally on our way to Alaska! We haven't seen any jaw-dropping scenery or big critters yet but we know we will in another day or two. We're following the same route northbound through Alberta, British Columbia, and the Yukon that we took three years ago. 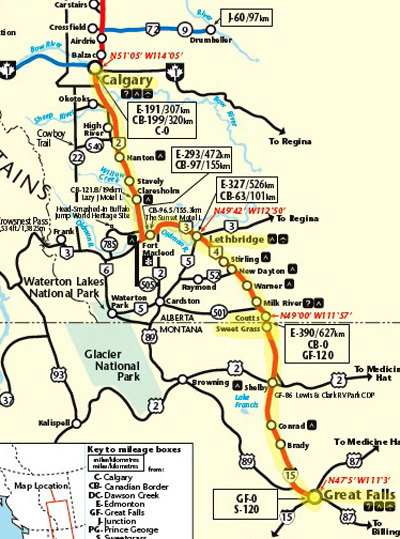 This isn't the exact route described in the North to Alaska website above, which includes the Icefield Parkway through Banff and Jasper National Parks. We plan to return that way in the fall, via the Cassiar Highway. The next six entries will include trip notes through Canada for each day from Great Falls, MT to Whitehorse, Yukon, where we plan to spend a few days. 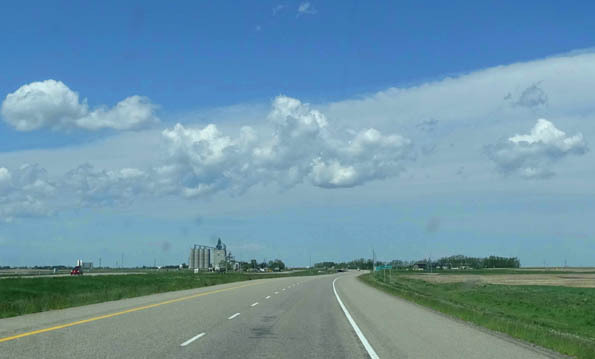 I'll include photos and information about routing, road conditions, terrain, crossing the border into Canada, interesting sights along the way, campgrounds where we stayed, and activities we did each afternoon after getting set up for the night. Puppy love: Cody is 12 now and Casey will be 3 in August. 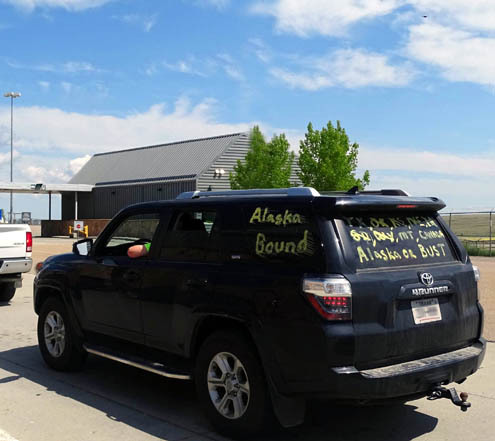 We left the Odyssey minivan in storage at Malmstrom until our return to Great Falls in September. It's handy to have in the Lower 48 but would be ridiculous to take all the way to Alaska since we'll have the truck to drive. 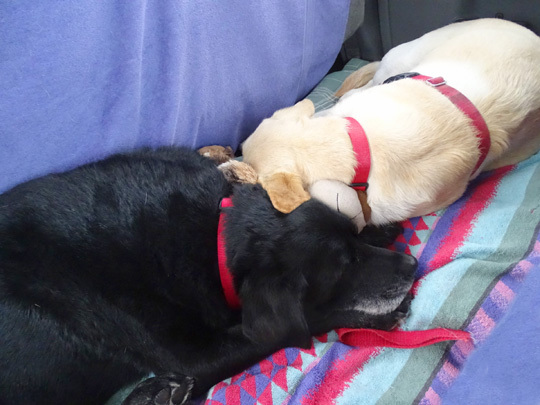 Jim's happy to have his navigator and co-driver back and, as you can see, the dogs settled right into their familiar comfy positions behind our seats and slept most of the way. ROAD CONDITIONS, TRAFFIC, TERRAIN: Traffic extremely light on I-15 once we cleared Great Falls. Also light until we got to Lethbridge, AB, a city of 88,000+ people. Moderately light from Lethbridge to about 30 miles out from Calgary, where traffic increased but moved at or above the speed limits. Everything was four-lane until we were about 30 miles from Calgary, when it became six-lane. The roads aren't really freeways; there is some limited access with exits like freeways but most of the way was unlimited access for intersecting roads and driveways. 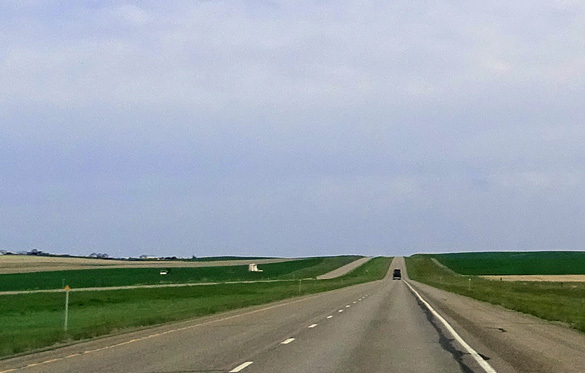 The speed limit was 75 MPH in Montana and 68 MPH/110 km for much of the distance in Alberta. Jim averaged 62 MPH with the 5th-wheel in tow. 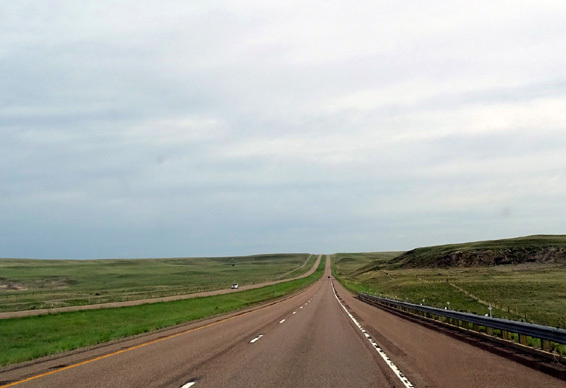 This route is all flat to rolling terrain, mostly through rangeland. There was no road construction -- none! Our only slowdowns were for towns. It took us about eight hours with stops at two rest areas, the border crossing, and to get fuel ($2.99/gallon diesel at Sweetgrass, MT). WEATHER: Fantastic! It was sunny and clear enough to see the Rockies and Continental Divide to the west from Lethbridge to Calgary. Temps ranged from the mid-60s F. to the low 80s. The solar panels charged the batteries all day so we used the Fantastic Fan and ceiling fan to stay cool in the evening in the parking lot at Walmart. We were a little concerned about this, after our annoying, time-consuming search last summer going into New Brunswick. We did the same prep as always, with everything we thought we'd need in the truck -- passports, drivers' licenses, vehicle registration and insurance, list of produce and poultry/seafood, dog vaccination papers and health certificates, bear spray. We reached the border about noon and waited 27 minutes behind more than a dozen vehicles, including several smaller RVs. Soon vehicles were really backed up behind us. After about 15 minutes a second lane opened up so we reached an agent a little faster. We saw one car pulled over for an apparent inspection but no RVs in front of us were searched. We figured they might pick us, but nope, we got through in just a couple minutes! Yay!!!! 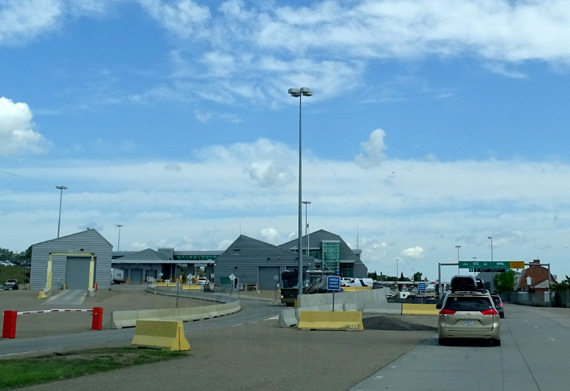 The Canadian border agent was young and more personable than some we've met. He asked us only for our passports (not drivers' licenses), where we live (just nodded in understanding when Jim said we're SD residents but travel full time in our RV), where we're going, how long we'll be in Canada, whether we plan to sell anything in Canada, if we have tobacco or alcohol, and if we have weapons (bear spray OK; he didn't want to see it). There were lots of other questions he could have asked or information re: truck/camper registration, insurance, food items like raw eggs and chicken that are banned, etc. but he didn't. Maybe it's a good thing when the line is long! Or maybe it was because Casey-pup charmed him . 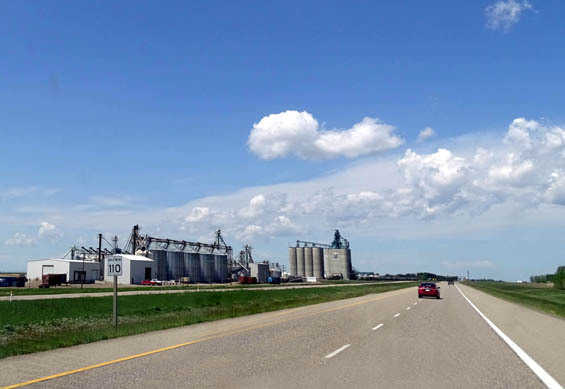 . .
1) We passed many massive agricultural operations in both Montana and Alberta -- huge ranches, big bright green planted fields, great big silos waiting to be filled with grain. 2) Streams were full but not flooded in MT and AB. There was some standing water in fields. 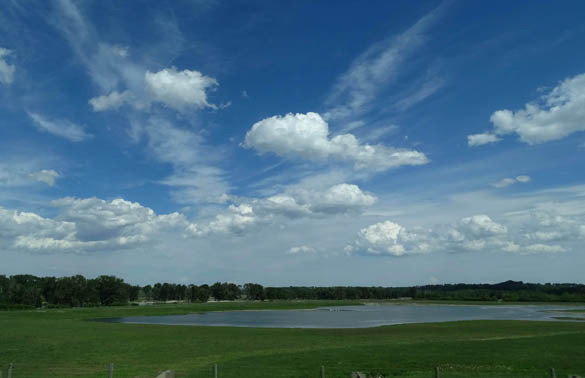 Both Montana and Alberta are usually relatively dry in the summer so everything will probably be tan or brown on the return trip in September. 3) We saw some large lilac shrubs in bloom in the towns and cities. I didn't notice very many wildflowers along the roadways, even dandelions. 4) We enjoyed the views of the Rockies; some peaks have snow on them. I hope we'll be able to drive through Banff and Jasper parks on the way back in the fall. This is our second time staying at the same Walmart in southern Calgary (exit 247 on AB 2). On this Sunday afternoon and evening the parking lot isn't very full. There are several small, old Class Cs and two vans parked near each other that we assume are seasonal workers who are living here. We've seen that at other Walmarts in Canada. We appear to be the only RV just staying overnight. Jim went to McDonald's inside Walmart to get online (more about our use of WiFi in Canada below) to find campground information for tomorrow night, update weather forecasts, and check e-mail. We can get several TV stations, including Global local and national news. Since we came across the border with almost no fruits, veggies, eggs, or poultry (so nothing would get confiscated) we restocked at Walmart this evening to the tune of $85 CA. $1.049/liter today. Jim went about 1/2 mile to the Calgary Co-Op and got diesel for $0.989/liter = $3.74/gallon Canadian, or about 25% less in American dollars. Visiting Canada is interesting because there are enough differences to realize you aren't in the U.S. any more -- e.g., currency (loonies, toonies, no pennies, translucent inserts in paper bills), spelling (centre, litre), the use of kilometers, liters, and Centigrade -- but Canadians speak the same language (mostly! ), often look and sound like U.S. natives, and have many of the same chain stores, music, etc. As in prior visits to Canada, however, we've had to make some financial modifications for the time we'll be in the country, including temporary health insurance and the use of our cell phones, MiFi, and credit cards. When we're in the U.S. we pay for almost everything with cash-back credit cards and pay off the balances every month. We plan to pay cash for everything in Canada, including fuel, so we don't incur credit card foreign transaction fees. Withdrawing Canadian currency from ATM machines with one of our cards is almost free. That plan worked well last summer in the Maritimes for a month. The U.S.-Canadian exchange rate is much better this summer than in 2012 and 2014 -- to our advantage, not theirs. $400 CA from the ATM today = only about $310 withdrawn from our account in U.S. dollars. Unfortunately, using our phone and MiFi in Canada is still too expensive with our Verizon plan to use the MiFi so we'll get on public WiFi when we can and avoid any financial dealings while on unsecured internet. We paid all our bills for June online while we were in Great Falls. There are other internet plans but they are too complicated for the relatively short time we'll be in Canada in June and September. Jim called Verizon to modify our plan for phone calls as we were driving toward the border this morning. Previously we've paid $15/month for each line to use our phones in Canada, with more limited minutes allowed, and we could go back to our regular plan at any time. The fella who talked with Jim first had him on hold several times for a total of about half an hour, which was very frustrating. The rep finally transferred him to someone in the "global" unit that told us that A/O the beginning of 2015 our antiquated flip phones may be of limited or no use to us in Canada because of new technology that's incompatible with the old phones. The rep offered to send us a smart phone on loan while we're here for $20 shipping and we'd return it when we're done with it . . . but that's not real practical because we'll be in and out of Canada three times over four months. We declined. We agreed to try the modification for $10/month with 100 minutes on each phone, including calls to each other, which are unlimited in the US. If we can't use our basic phones in Canada, we can get our money back.